ETS train from KL to Penang is one of the most popular train routes in Malaysia. Locals and tourists both travel between these two top cities for many purpose. There are many things to do in Penang. Train from KL to Penang will terminate in Butterworth train station, which is located at the mainland of Penang. You can find nearby hotel if you choose to stay in Butterworth or aboard the ferry to Penang Island. The train trip duration does not differ much between ETS Platinum or ETS Gold. ETS Platinum have fewer stops compared to ETS Gold and complimentary snacks is served for ETS Platinum passengers. Click to see the ETS train schedule. Below is the latest timetable for ETS train from KL to Butterworth via Gemas-Butterworth-Gemas route, valid from 1st August 2017. 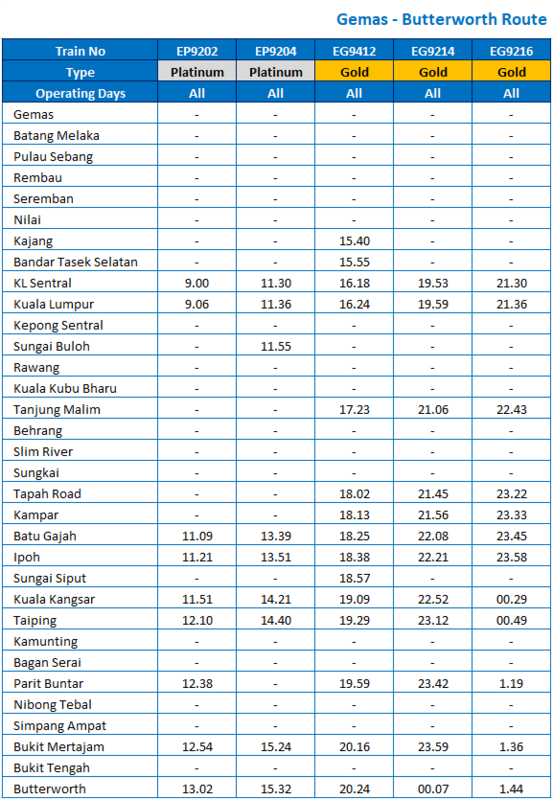 If you took ETS Silver from KL Sentral, you can only reach Ipoh. Therefore, you might need to change train in Ipoh and buy a new ETS ticket to Butterworth. KL Sentral is a famous transportation hub in Kuala Lumpur. 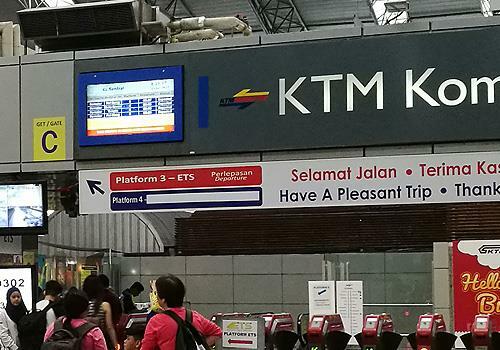 Passengers usually depart from KL Sentral because it is easy to reach KL Sentral from many directions. KL Sentral is one of the stops for many public transports such as LRT, KTM trains, KLIA transit, Rapid KL and buses. Therefore, it is easy to go to Penang from KL Sentral. KL Sentral has complete facilities such as washrooms, surau, convenience store and eateries. Once you booked your tickets, go to ETS platform to board the train. Please make sure you are going to the right platform. The train route map is available at the gateway. Butterworth Railway Station or Butterworth train station is located in the mainland of Penang, close to the ferry terminal to go to Penang Island. The area is currently under construction but the train station is still operating to serve the passengers traveling from and to Penang. In the future, the train station will become Penang Sentral, an integrated terminal for bus, train and ferry. To go to the ferry terminal, walk and keep left when you leave the building until you see stairs leading up to the ferry terminal. There are many signboards to guide you to the ferry terminal so just follow the signboards. 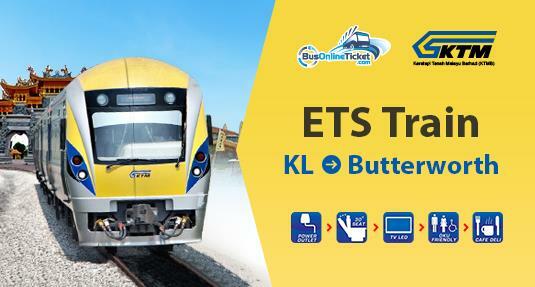 ETS train from KL to Butterworth is popular especially during festivals or public holidays. Hence, the ETS ticket is sold out very quickly. ETS train ticket online booking is more convenient and a safer choice if you want to reserve your seats. Book your ETS train ticket at BusOnlineTicket.com and get instant confirmation sent to your email. Save time and cost by booking ETS train ticket online!